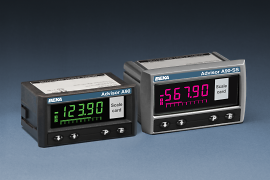 High quality universal process panel meters featuring a bold five digit display and bargraph visible in most lighting conditions. The display colour can be configured on-site to match other instrumentation and can change to show the meter’s alarm status. The meters have process current, voltage and resistance thermometer inputs and are available for use with a low voltage dc or mains power supply. The rugged A90-SS has a stainless steel enclosure and a toughened glass window suitable for installation in areas where it may be impacted. Meters are supplied calibrated to customer’s requirement including a printed scale card for no additional charge.